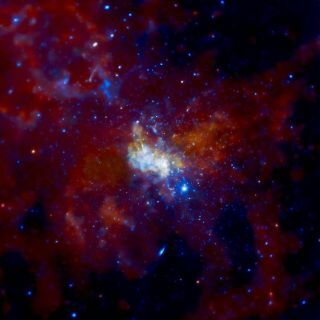 This image of the supermassive black hole at the center of the galaxy and the region surrounding it was taken by NASA's Chandra X-ray Observatory. Near the supermassive black hole at the Milky Way's center, astronomers have discovered strange, puffy objects that look like gas clouds but act like stars. A team led by Anna Ciurlo, a postdoctoral scholar in the Division of Astronomy and Astrophysics at the University of California, Los Angeles (UCLA), made the discovery using 12 years of data from the W. M. Keck Observatory on Mauna Kea in Hawaii. The team discovered these objects by measuring the wavelengths of light released by the structures of gas and dust at the galaxy's center using the Keck Observatory's OH-Suppressing Infrared Imaging Spectrograph. The researchers presented their findings at the American Astronomical Society meeting in Denver on June 7. Based on characteristics such as the objects' movement, the researchers think the objects are dusty stellar objects called G-objects. This 3D spectro-imaging data cube allows researchers to distinguish between G-objects and background emission. This also allows them to follow how G-objects move and behave around the supermassive black hole. Now, with these new observations and newly discovered G-objects — G3, G4 and G5 — the researchers think the objects are so-called bloated stars. These are stars that have become so large that the tidal forces exerted by the central black hole can pull matter off of their stellar atmospheres when the stars get close enough yet have a stellar core with enough mass to remain intact, said UCLA astronomy professor Mark Morris, a co-principal investigator and member of UCLA's Galactic Center Orbits Initiative (GCOI). So the question is, why are they so large? Morris said in the statement. The GCOI thinks that the gravitational pull of the nearby black hole could have caused the collision of two stars orbiting each other, and this star merger could have created G-objects and made them so large. A cosmic collision like this could explain the appearance of these objects because "in the aftermath of such a merger, the resulting single object would be 'puffed up,' or distended, for a rather long period of time, perhaps a million years, before it settles down and appears like a normal-sized star," Morris said in the statement. Researchers have even more questions about these "puffy" cosmic objects. Once the researchers can observe the objects traveling near to, and interacting with, the supermassive black hole, they will have a better idea of the objects' behavior and nature. For now, the researchers know that G-objects move very quickly and close to the Milky Way's supermassive black hole, according to Ciurlo in the statement. But the researchers are still working to understand how these objects got there and what they will become. "They must have an interesting story to tell," Ciurlo said.